Used Audi A5 Review - 2016-present Servicing, MPG, Insurance | What Car? What used Audi A5 coupe will I get for my budget? Prices for this generation of A5 start at around £25,000, at the time of writing. This is for a low to average mileage car with a full history bought from a franchised dealer. Most will be the best-selling 2.0 TDI 190 diesel version, with the occasional four-wheel drive car up for grabs, too. These prices represent a healthy discount on the new price. Up the money to nearer £30,000 and you’ll get your choice of engines and trims on barely used cars. How much does it cost to run a Audi A5 coupe? Not surprisingly, it’s the diesels that are the most economical, in particular the 2.0 TDI 190 Ultra version, with an average claimed figure of 68.9mpg. The 1.4-litre TFSI petrol engine claims an average 53.3mpg, in some trims, while the 2.0 TFSI petrol sees an average 50.4mpg. 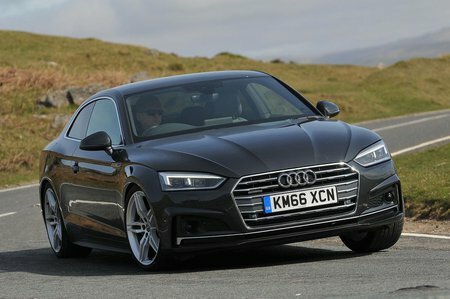 You’ll need deep pockets to fuel the 3.0-litre S5 version, which claims an average fuel consumption of only 36.7mpg. Insurance groups will naturally be on the high side for this swift coupe, ranging from 29 up to 42 for the S5. The A5 comes from new with a three-year/60,000-mile warranty. Audis do tend to be expensive to service at franchised dealers, but once these models are three years old they will qualify for Audi’s fixed-price servicing deal, which costs from £164 for a minor service and £319 for a major one (based on a 2.0 diesel model).